If you can't make jewellery for your friends, who can you make jewellery for? I aways say! So when Nadia Albano asked me to make her a special piece of body jewellery, I jumped at it! 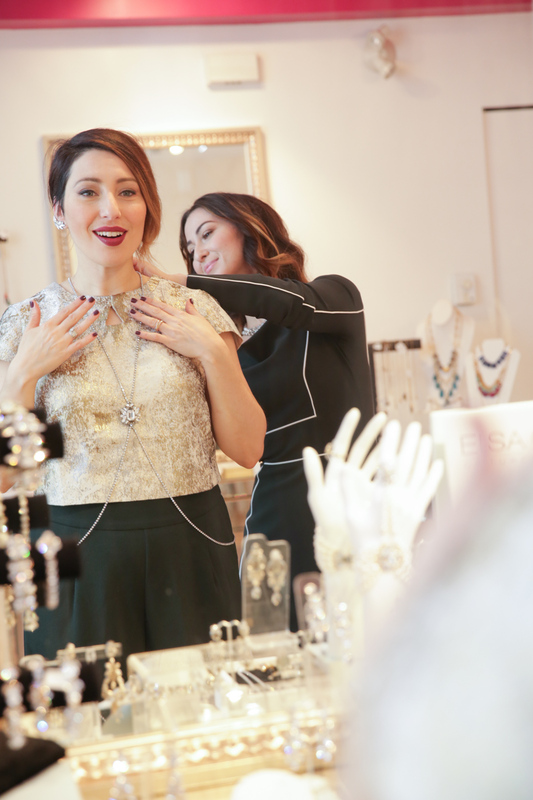 Nadia produces a weekly makeover column in The Province newspaper and is also the owner and operator of Nadia Albano Style Inc., a boutique studio located in Vancouver’s Kitsilano area. If you follow me on Instagram then you might recognize her work from some of my selfies, as she often does my hair and makeup for special events! A few weeks back we did a little photoshoot in our shop, which she blogged about, and it was then that I presented her with her piece! This was one of the first pieces that we were able to use our new 'fabric-friendly' crystal chain on, it is sans claws and promises to not catch on clothes-which is a must on a piece like this. It also looks amazing with the ear climber we made for her previously, doesn't it? Keep scrolling down to the end to see the newest one we designed...it's our new favorite! "Work, turn to the left, work, now turn to the right! Work, sachey chantey"
And Viola! Here is the final look complete with the newest, Grande Dame of ear climbers! If you are thinking of adding a custom body chain to your wishlist, visit us in shop to start the process! Thank you so much to Daniella Ciuffa Photography for capturing the moment and to Wardrobe Apparel for the amazing Greta Constantine Dress I was wearing! At the end of November, we will be hosting a holiday-slash-bridemaids Trunk Show in collaboration with Wardrobe Apparel showcasing selected Greta Constantine pieces in the shop! Stay tuned for more details or email us for your exclusive invite!